(11-18-2017, 11:12 AM)Espermaschine Wrote: [ -> ] Nice video ! (11-05-2018, 08:47 PM)carmen Wrote: [ -> ] Sorry, but AFAIK, neither 'Combine' nor 'Union' in Inkcaspe would work for importing 'Text as path' (nor any path with 'holes' like O or subpaths like i) into Gimp. 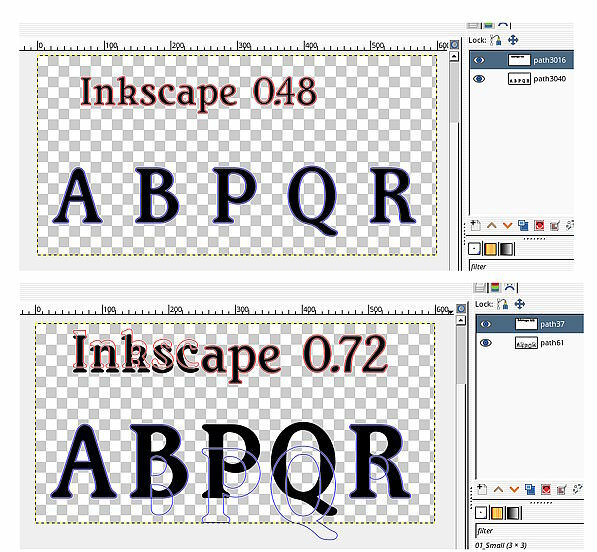 (11-06-2018, 01:36 PM)rich2005 Wrote: [ -> ] Fortunately I can run the malformed Inkscape svg through SK1 https://sk1project.net/ to get a corrected file. (11-05-2018, 11:11 PM)Espermaschine Wrote: [ -> ] EDIT: i just tried the 'Union' method with five different fonts and they all imported okay into Gimp, so i think its definitely dependent on the font you use.